The map feature has been updated to a Map of the Month system. 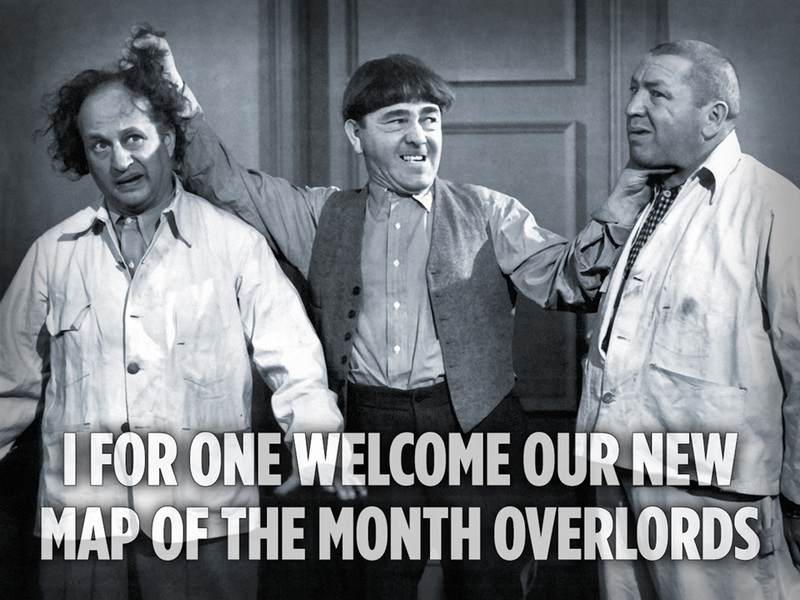 Each month, an outstanding map will be selected to be showcased as the MOTM. The map gets featured in online rooms, and players get awards for winning on it! 1) Post the name of the map along with a link to the map's webpage so there's no mixups and people can see details. 2) If you'd like to discuss a map in more detail, start a new thread with your thoughts (or look for a thread about that map and post there). 4) The sweet spot for multi-player maps is 40-60 countries. The closer your map is to that size the better chance it has of becoming a really popular MOTM. The once Map of the Week (MOTW) is now The Map of the Month (MOTM). I like the idea of having it for a whole month rather than a week. I went and re-jiggered the tally points for the MOTM. I made it weighted much more towards full-house and multi-human games. Can u be more specific? ok, interesting... bonus in MOTM is off? PJB won't talk to me because I am a drunk. jesterme wrote: PJB won't talk to me because I am a drunk. Absolute silliness! The best time to talk to you is when you are drunk! 4th Edition is beyond stupid when bio'd. Worse than Deux. Congrats to Whirlplaid for winning the Napoleonic Wars HD month! The new Map of the Month for April is Castle Lux MP - a fast castles map designed for multi-player games. Check it out! 'Alternative maps' & two of the lux 'staple' maps are scheduled the next two months? Don't get me wrong both of the next two maps hold a special place in my heart & are a lot of fun, but can we get some MotM variety? Both of those maps were already MotW & are played all the time. I would like to request that 1 of these 3 maps be selected for the MotM coming soon - Ched Nasad (evil fun)- Great War - Revised (100 year anniversary of said war) - Tribar Assault map (fun hyjinxs! ). Or any other fun suggestions or ideas for upcoming Monthly maps. Where is the map lab? I need to know where I need to send my evil minions to abduct Mbauer, I mean send him his new giftbaskets of Kiwi's & figs! & yea I think 4th edition bio would be silly but was just trying to suggest a new or alternative bio staple map than deux. Looking over the past MotM's & MotW many of them have featured or favored Mbauer or Sillysoft maps, can we please for the ♥ of get some LF (other than IRE for reasons explained in my previous post) , Behemoth's, or other fun or talented maps featured? 963 other maps out there.... surely there are some hidden gems that others would enjoy playing on? like, the Land of Oz! Dustin or Mbauer could one of you please respond? or alter the MotM upcoming schedule with someone other than Mbauer's maps? on a side note I have to say I like the Tally rankings system this way. & will there ever be a MotW again? With the addition of some new steam players, plus the new exponential cards settings, I thought it was fitting to feature Rome II and Expletus as MOTMs. As well, I'm being much more discerning of only selection very playable maps as the MOTMs. Feel free to keep requesting maps, but I reserve the right to only feature maps I think will play well as MOTMs. Rome II plays pretty poorly with exponential cards; I'd rather wait for para's adaptive cards before making it a featured map. Expletus is just funky to begin with, so I have no opinion on that. I agree with Rhye regarding the current exponential card settings. Even 5, 10, 15 ^ 5% is too fast through the middle rounds for Rome and not nearly fast enough in later rounds in order to prevent marathons, and if I may be perfectly frank, then the same problem applies to Biodeux, Expletus, etc., as the official exponential curves aren't a good fit given the overall progression of continent bonus values and army counts in most games. dustin wrote: With the addition of some new steam players, plus the new exponential cards settings, I thought it was fitting to feature Rome II and Expletus as MOTMs. There are over 900+ maps & primarly the MotW & MotM has favored maps by Mbauer or "sillysoft" which in my opinion aren't very multiplayer friendly or easy to understand. WW2 - Reduex was a mess with the hidden connection that didn't connect & missing the connection that was visible on the map. I also notice all the old MotM's are off by a month. Ie. ww2 reduex shows up as April's MotM when it was in fact May's map. & what about the MotW? will it be restored someday or is it just gone forever? Given the choice, I'd revamp MOTW/MOTM as part of a broader rankings redevelopment. One week was always much too short a timeframe as players are only just beginning to understand the strategic nuances of a map by the end of the first week. One month is too long as curiosity wanes and most players lose interest; doubly so especially when the map chosen proves unpopular early on. Furthermore, if we're being totally honest here, then we need to admit that almost none of these maps are ever played online again after their time in the spotlight. Kinda begs the question of whether or not MOTW has ever been successful in terms of nurturing more diversity within Lux. I suspect most of us would say it has been a failure in that regard. I'd much rather see a "basket" of four featured maps that are given a modest RAW bonus in the overall ranking and seeding system. A new map could be cycled into the basket every two weeks while another is cycled out. New rankings for these maps could be created that place less emphasis on quantity of play and reward quality much more. Rankings could be broken out by each featured map individually as well as a broader metric based on all four maps. There always been a great opportunity to be much more creative about encouraging Luxers to play outside of their usual comfort zones. We've gotta be willing to try new things though rather than relying on the same old same old. There are exactly 4 maps that are played now. If the point of the MotW/M was to promote diversity and alternative maps how does it help to use it to showcase two of the Staple maps during the "slow" summer months? If I were you I would just shuffle their positions to Sept. & Oct.; if lux is going to keep the MotM format. If it goes bi or tri weekly then you'll have to fill in the gaps to make up for the additional time. the MotW/MotM was for many months dark or otherwise defunct. I think there should be more than 4 flavors of lux, but I guess that's just me? If there is going to be significant reform of the Map of the Whatever that's fine, Just please inform the rest of Luxtopia. Also; Para any chance of reviving the Winner Pick's hosts? just curious as those FH games were a heck of a lot of fun & we played on quite a few fun maps! Let me tell you about...the motf: it rocks. Usa warzone incorperated is fun. Me like. Boring are the opponents. I m happy to see rome2 is up next.some quality maps should be played. Not some bs map for a week. I'm with you guys. Gg. Where are the older motm results? like the ones from dec - feb? Why are the MotM results all mislabeled by a month? Any chance the MotM overhaul, update or revamp will be revealed or discussed further in this thread? or are we all just victims of the creator or maplab's apathy? plans to eliminate the raw bonus? any word? MOTM started up in March. there was a period around dec-feb where there wasn't really a MOTW or MOTM. I've fixed the mislabeled month issue, thanks for pointing it out. So dec - feb MotM's never happened? Na Finna's ranking page says otherwise, while he won the feb MotM 'monkey' . I find it strange/odd that there will be no posted tally or results for those months, but as Lord Quasar says so it shall be... WIll there be a MotM revamp or update soon? Ty for the correction of mislabeled MotM results. I am requesting that "The Great War - revised" be added to the MotM lineup when maplab releases the new awesome super fun map! (any similarities to any other maps of a similar name is mostly pure coincidence) Thanks!